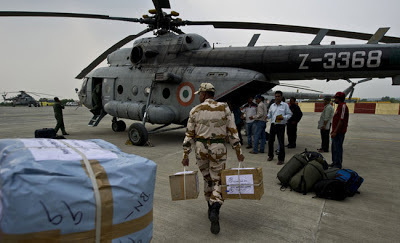 A mere whisper of the catastrophe that has struck the ‘abode of the Gods’ – the Himalayan hill States of Uttarakhand and Himachal Pradesh makes one shudder with fear. The devastation caused by the furious flash floods is extremely tragic that has resulted in widespread death and destruction. A miasma of anxiety has descended on the region as this tragic incident has left many bereaved and others scarred for life. 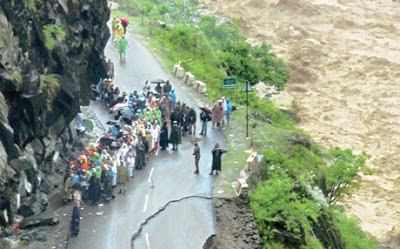 Whole villages have inundated, stretches of roads have washed away and communication links have snapped. 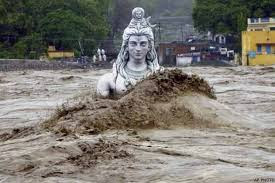 The Ganga, Yamuna and other rivers have reached levels never seen before. Thousands of people from different parts of the country who were undertaking pilgrimage to the religiously significant temples in the region remain stranded – sans food, sans water. The death toll is rising with passage of each day and the figures of those missing are yet to be ascertained. Who is to be blamed for the disaster? Nature? Excessive rainfall is not only an unconvincing but also a trivial excuse for this misery. Had it not been for man’s excesses and ruthless exploitation of nature, we would not have witnessed such fury. After all, tampering with conventional forms of nature has always resulted in man’s suffering. In fact, it is a consequence of indifference at various levels and environmental degradation in the name of development. The Himalayan watersheds have witnessed unprecedented deforestation, mining and quarrying activities over a long period of time. In the name of infrastructure development, a large number of forests have been diverted for agriculture, human settlements and urbanisation. The change in land use pattern has led to poor soil stability on steep slopes and made the region fragile. The Himalayan ecosystems have witnessed faster rates of warming in the last 100 years. Low vegetative cover has failed to slow the speed of falling rain water and water discharges due to melting of glaciers, down the slopes. This has led to soil erosion which leads to floods and landslides. Increased economic activities and expanding urbanisation have played havoc with the environment in the hills. Politicians and civic authorities have remained indifferent to the enforcement of land use control laws, permitting large scale dam building and illegal construction of human settlements in the ecologically fragile region. Manipulation of rivers and their hydrology have not only weakened the slopes but also destabilised them. Hunan movement into the Himalayas for pilgrimage or for recreation have led to heavy vehicular movement and resulted in mushrooming of towns, resorts and other cheap accommodation along the river banks. This has posed a severe burden on the region’s carrying capacity. There sudden collapse, therefore, goes on to buttress the fact that they were highly vulnerable to the fury of natural forces. A mighty task of evacuation, relief and rehabilitation lies ahead in the aftermath of this disaster. There needs to be an integrated policy on Himalayan development. This calls for a comprehensive renewal of the construction techniques employed. It is necessary to restrict the number of pilgrims in the fragile areas. All vulnerable settlements must be relocated away from the rivers and those found guilty of violating the construction norms must be severely punished. It is equally important to prioritise the existing dams and refrain from construction of new ones as far as possible. Better systems of forecasting and dissemination of weather-related information are also essential. Massive afforestation must be undertaken to restore the green cover of the region to its original level. It is high time the authorities stop the blame game and react to this alarming situation. The need of the hour is to strengthen our disaster preparedness and rise above our mundane issues to develop ways for peaceful co-existence between nature and man. Let us pray for the rescue of our fellow citizens who are experiencing the most agonising and horrifying moments of their life.